4. Consider what it means to preach a reflective genre… reflectively. We have already seen that wisdom literature requires reflection. How might this impact our sermons in this genre? We need to give serious thought as to how we can encourage reflection in our listeners, even if it is only for the time we are standing up there preaching. Two thoughts on this; firstly avoid information overload. 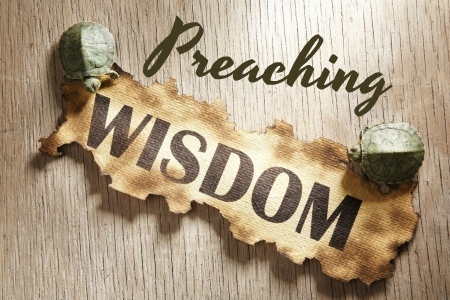 This is true for preaching any genre, but nowhere is it more important that in preaching wisdom. Don’t bombard people with dozens of different thoughts or ideas; it doesn’t encourage reflection, it encourages confusion, headaches and people to stop listening altogether. Conversely then, create space. Create space to work out illustration and application – “You cannot serve both God and money” isn’t a proverb, but it is a good example of a relatively short journey from original context to contemporary application. But wisdom like Proverbs 15:5 “A fool spurns a parent’s discipline, but whoever heeds correction shows prudence.” will take some time to unpack. How does it apply for people who don’t have God-honouring parents? What about people whose parents have died or who no longer under their parents’ authority in the way they once were? Does this proverb no longer apply to them? If so, how? And what are the subtle ways we all try to squirm out of correction – wherever it comes from? Be creative, take time to explore this piece of wisdom from as many angles as you can. Finally, create space to think, respond, pray. Why not give people time to do this at some point in your sermon (and not necessarily just at the end)? 5. Identify the central issue of a book. This is crucial. In a book like Job, it is easy to forget that the central tension of the book is presented very clearly in chapter 1, Satan says to God that Job loves God not for who He is, but for what He gives Job. The accusation is that Job loves God’s stuff more than he loves God. And the tension of the rest of the book is, in many ways, an exploration of that accusation – will Job’s faith stand up to the accusation, or not? It’s important to work out everything which follows in light of this. In Ecclesiastes you have to go to the end of the book to find the central issue – (12:13–14) Keep this conclusion as your focal point as you drive those windy roads of Ecclesiastes!